On Armed Forces Day, MAY 19, 2012 the Notre Dame Assembly 2144 and the Third Texas District made history. 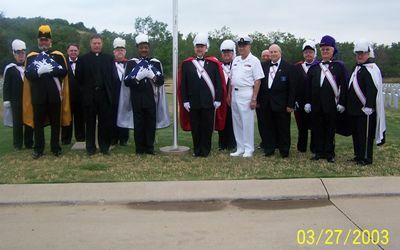 For the first time in the history of the Order a plaque and flag pole were dedicated in a National Cemetery to those who have served their country in the Armed Forces by the Knights of Columbus Fourth Degree. Participating in the flag raising ceremonies were the Executive Director of the Texas National Cemetery Foundation, Gary Phillips, Senior Chief Petty Officer, ret. Third District Master Mark Hesselgrave, Diocesan Deputy Roger Scott, Faithful Navigator Dave Axberg & members of the Notre Dame Assembly and Color Corps. The plaque and Flag Pole were blessed by Father Jonathan Austin, Friar of Notre Dame Assembly and pastor of St. Jude’s Chapel in Dallas. A prayer was said for all those who served in the military both past and present. This flag pole and plaque will be maintained in perpetuity as a symbol of the respect and honor the Knights of Columbus Fourth Degree has for those veterans who have served our country.